Reveals the secret expectations harbored by business school professors when viewing presented material. Designed to offer a competitive advantage to anyone interested in a career in business, this book offers a truly unique means of developing powerful presentation skills. 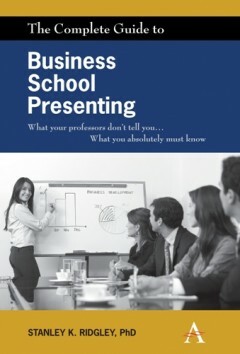 ‘The Complete Guide to Business School Presenting: What your professors don't tell you... What you absolutely must know’ reveals the secret expectations harbored by business school professors when viewing your presentations. Offering a competitive advantage to anyone interested in a career in business, this award-winning guide provides a truly unique means of developing powerful presentation skills. The guide identifies the seven verities of speaking that form the bedrock of superior presenting in the twenty-first century, and which imbue any speaker with power, energy and confidence: stance, voice, gesture, expression, movement, appearance and passion. These presentation techniques can transform a person’s professional life, ignite the potential for landing a higher position, and distinguish a business student from the vast majority of their competitors – all by correlating directly with the inherent values of corporate America. The book also discusses the utility of business analysis tools, such as “SWOT,” “PEST,” “value chain analysis” and Porter’s “Five Forces,” and demonstrates how to work seamlessly and effectively with PowerPoint to deliver concise and persuasive presentations. It also addresses the innate challenges of working as a group and preparing group presentations – a requirement of all business students and a highly sought-after skill amongst corporate recruiters. In addition, a section on preparing for case competitions – a major rite of passage for business majors and MBAs – is included. The result is a masterpiece of business school wisdom and practicality. Stanley K. Ridgley is Assistant Clinical Professor of Management at Drexel University’s LeBow College of Business in Philadelphia, PA.